“Afraid? Batman’s not afraid of anything. I’m afraid that The Joker may be right about me. Sometimes…I question the rationality of my actions. You’d be hard-pressed to find another superhero comics scribe as abstract, dense, avant garde and completely effing out there as Grant Morrison. Jumping forward in time a little, the man was responsible for an epic Batman journey that saw the Dark Knight gain a son, lose his life, kill a god, return from the end of time and set up a global crimefighting franchise. Oh, he also saved the world and ended up losing that son, so y’know, easy come easy go. But before all that, Morrison crafted a neat little nightmare of a story where Batman has one particularly bad evening. Enter Arkham Asylum. I’m going to do major disservice to the thematic and subtextual goldmine that is this book by overly simplifying the plot – the Joker takes over Arkham Asylum and baits Batman to come get him. Upon entering, the latter discovers that Joker and all his supervillainous inmate buddies would just much rather that Batman stay and live with them to have all of Gotham’s freaks under one roof. It’s kind of a nice, psychotically-welcoming idea when you think about it. Like someone invites you to live with them in their basement full of butchered cadavers and Justin Bieber albums; the gesture’s nice, even if the location’s a bit off. 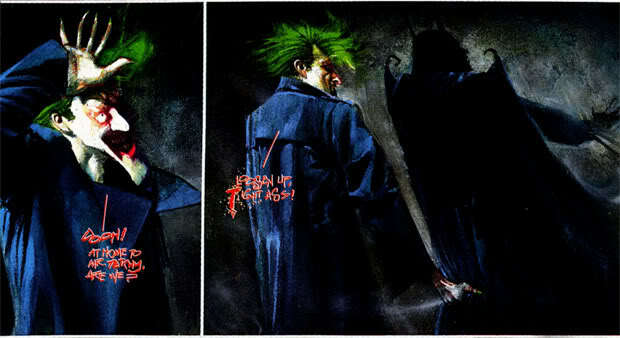 Arkham Asylum is a slightly longer one-shot that confronts Batman, Joker, Two-Face and several other villains with a distinctly psychological angle of attack. Darkness, duality and true monstrosity under Batman’s crimefighting persona are all touched on, offering the position established in this review’s opening quote: is Batman becoming, or is he already, as crazy as those he’s locking up in the asylum time and again? Are they truly the closest thing to family he’s got? Will such a realisation lead to awkward Thanksgivings where Joker cuts the turkey with an electrified chainsaw while the Riddler obliquely hints at where he’s hidden the applesauce? As with The Killing Joke there’s a ton that can be said about the brevitous page count, not least of which is the open question of the story’s relationship to reality or, as Morrison postulates on Kevin Smith’s podcast, its actuality as a really bad dream Batman once had. (I can’t remember which episode he said that in, but you should just google ‘Grant Morrison Fatman on Batman’ and listen to them all anyway) The word I use time and again, both in this review and in describing the book to friends, is ‘nightmare’: it’s a surreal, Gothic, haunting narrative that is less concerned with plot, though obviously there is one, and more with character. I’m probably sounding pretentious as balls right now, but keep in mind I’m doing a PhD. It kinda goes with the territory. The book also feels a bit more concerned with the setting and the visuals than with a strict story per se. 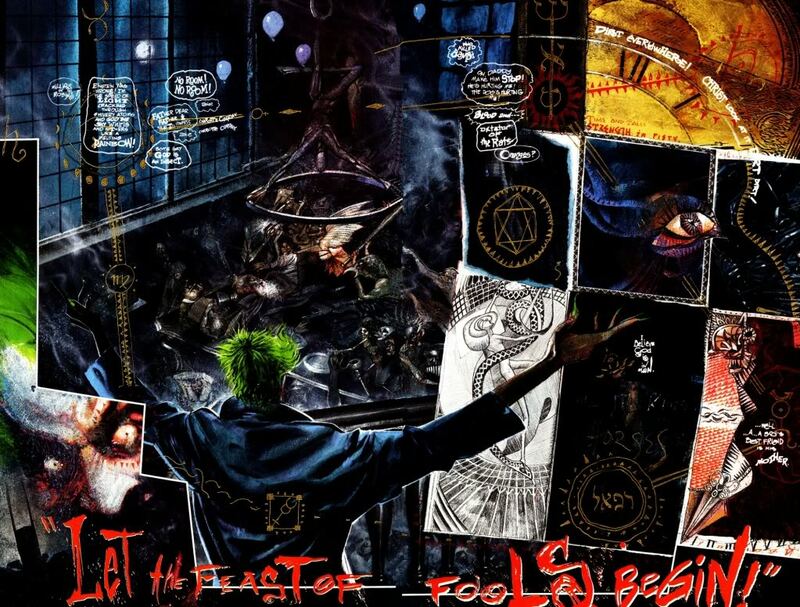 After Batman enters the titular Asylum we get a couple of small digressions involving villains like Two-Face and Killer Croc, and a longer one involving the Asylum’s obliquely-referred-to history and its founder Amadeus Arkham. I guess being deliciously mired within a setting this weird works on its own merits; TV shows like Mad Men show us we don’t necessarily need a fully straightforward narrative when the setting can do a lot of the engrossing work entertainment’s meant to undertake. That said, unlike some parts of the ’60s Mad Men portrays, you do not want to actually exist in the Asylum. You may feel as if you’re mainlining LSD in one arm and crystal meth in the other. Yes, I know you don’t mainline crystal meth. I’ve watched Breaking Bad, too. 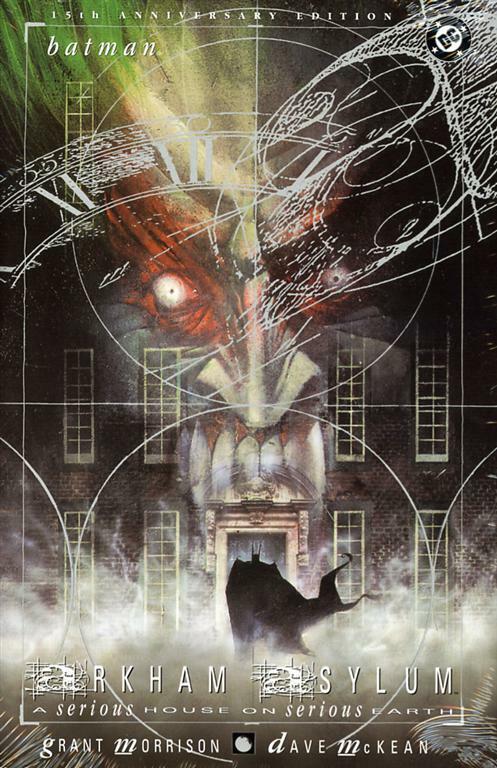 Though fantastic and engrossing, thanks in no small part to the story deftly and nightmarishly illustrated by surrealist artist and frequent Neil Gaiman collaborator Dave McKean, Arkham Asylum does have its drawbacks. 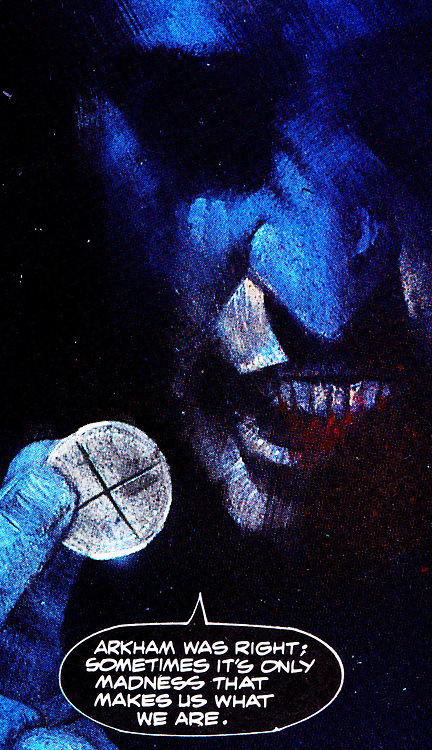 If you’re after something coherent, easy to understand but still thematically engaging, go read The Long Halloween instead; Arkham is a frenetic, not entirely straight A-to-B plot narrative that uses structurally daring panel layouts and judicious use of crazy artwork to tell a completely mental story. If mental characters and a story illustrated like Batman’s tripping on bad acid ain’t yo thang, there might only be so much you can take away from this before seeking a cup of tea to calm you down. I’d also highly recommend reading it at night, with a lamp and a small glass of your preferred alcoholic beverage. Trust me, it adds to the atmosphere. Its second-biggest influence – and one I’m completely pulling from supposition and thin air – was acting as a proof-of-concept that Morrison could write Batman, and he could write Batman well. 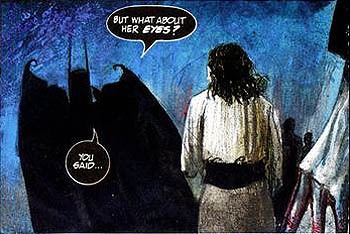 He did scribe a shorter run simply titled Gothic the year after Asylum was released (though I’ve yet to read it), but since Asylum‘s the book most often namechecked in regards to the respect Morrison’s given by comic readers then I’d say that had the more lasting impact. The decision to let him do (almost) whatever the hell he wanted resulted in one of the best Batman runs ever – a distinction I don’t use lightly. Go look at the links in the first paragraph for an idea of what I’m on about, though do try to ignore the fanboy gushy parts. While it’s something esoteric and not the kind of book I’d recommend to fans who don’t like depth in their cape stories, Arkham Asylum still stands as one of the most popular, if not most talked about, Bat-comics published in the last few decades. Even if it is a nightmare Batman’s having on a really bad night, it’s the kind of thrilling nightmare you’ll be glad you experienced.